Living in an older home in Hawaii Kai, the Tanimotos surveyed the style of their current abode and realized it was time for a complete overhaul. 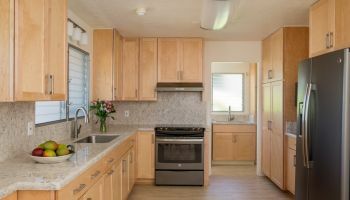 After seeing ads for Honolulu-based kitchen remodeler and designer Homeowners Design Center, the couple made a visit, and were so impressed that they decided to enlist the expertise of the second generation remodeling and custom design company. “Before” photo of the sink-side of the kitchen. According to staff kitchen remodeler and designer Jessica Omoto, “…to update the house and bring everything more current,” was the Tanimotos’ main objective when approaching their remodel. Specifically, the Tanimotos wanted to open the space up between the kitchen area and the living area, as there was a wall currently separating the two. “After” photo combining both the kitchen & dining spaces into one room. 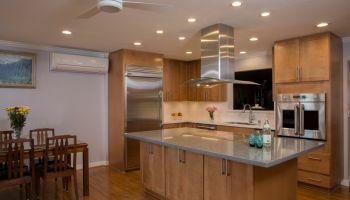 Remarkably transforming the space, the removal of the wall—and seamless extension of the kitchen into the dining area—proved to be a challenge that kitchen remodeler Homeowners Design Center was able to meet with expert savvy. The key factor, explains Omoto, “…was to make sure that we kept the flow, so that there wasn’t an eyesore where one could walk in and wonder, ‘what is that?’” The result was a success, producing a seamless transition between the (now) much more open kitchen, living and dining areas. “Before” photo with the oven on the right side of the kitchen against a wall. The couple also wanted to change the door leading from the garage into the kitchen, so that rather than opening indoors and blocking access to kitchen cabinets, kitchen remodeler Homeowners Design Center reversed the door’s swing, enabling it to open out toward the garage area, creating more usable, free space within the kitchen. Homeowners Design Center also addressed the Tanimotos’ windows—completely redoing them—as well as their bathrooms—the main focus also being to open up more space. Kitchen remodeler Omoto shares that by utilizing Canyon Creek natural maple Shaker cabinets “…to keep the light feeling, and not take away from the light coming in from the windows,” Cambria engineered quartz countertops (basically maintenance-free) and Armstrong Alterna water-resistant vinyl tile flooring, Homeowners Design Center was able to deliver the Tanimotos’ dream home update. To learn more about how kitchen remodeler Homeowners Design Center can help you plan your next project, or to see more of their projects, just click on the company name or on any of the photos above.